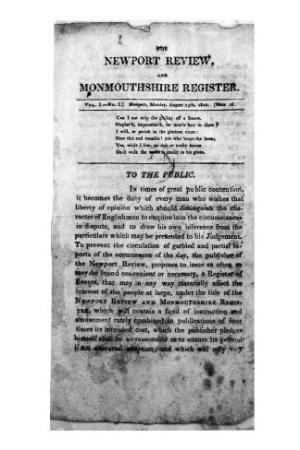 An irregular politically radical periodical circulating in Monmouthshire. The periodical's main content was political articles and included early contributions from the future Chartist leader John Frost (1784-1877), who was to play a prominent role in the Chartist uprising in Newport in 1839. The periodical was edited by the radical printer, Samuel Etheridge.